An industry-leader in UV LED print technology, Mimaki produces some the most advanced inkjet printers on the market. 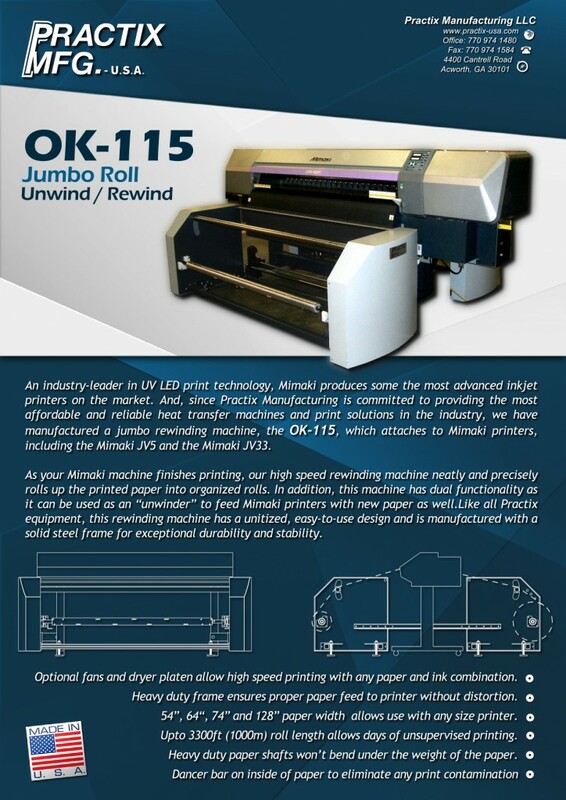 And, since Practix Manufacturing is committed to providing the most affordable and reliable heat transfer machines and print solutions in the industry, we have manufactured a jumbo rewinding machine, the OK-115, which attaches to Mimaki printers, including the Mimaki JV5 and the Mimaki JV33. As your Mimaki machine finishes printing, our high speed rewinding machine neatly and precisely rolls up the printed paper into organized rolls. In addition, this machine has dual functionality as it can be used as an “unwinder” to feed Mimaki printers with new paper as well. The benefits of our fusing machines don’t end there, as we can fully customize your fusing machine to match any height requirement and can paint your machine to match your company brand. We also back up our craftsmanship with one-year mechanical warrantees and six-month electrical warrantees on all our fusing machines and other heat transfer machinery. We offer next-day shipping on most orders, and we ship worldwide. So, call or e-mail us today and order a quality, reliable rewinding machine from Practix for your Mimaki printer. Call or e-mail us today to discuss our affordable fabric sublimation equipment for your business.